Milk Duds, what’s with the name? 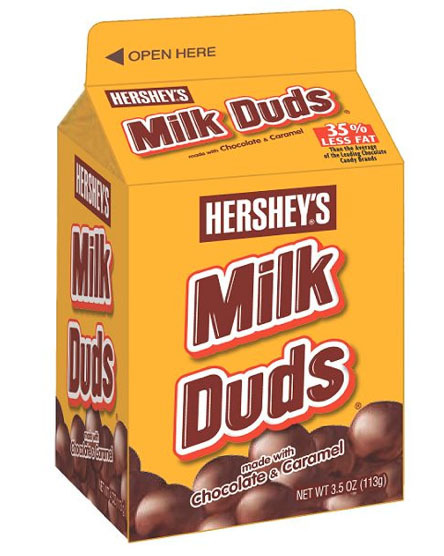 Many old-time candies have really strange names, and Milk Duds are no exception. These were clearly invented before the age of focus groups. Can you imagine a company today naming anything a dud? I am a fan of the Duds. I like the retro-looking packaging and I appreciate that they also come in a milk carton (for easy pouring?). They do claim to have 10% of your daily calcium requirement, and are Kosher, too!. These chocolate covered caramels are really chewy. Do not refrigerate them because they will be like chewing a candle. Don’t let them get too warm, or they will become a sticky lump, glued to the inside of the box. Once they get that way, there’s no saving them. I will be looking for these in my kids’ Halloween treat bags and squirreling the tiny yellow boxes away for myself. Next week Milk Duds vs. Rolos…. Posted in Caramel, chewy candy, Milk chocolate. Bookmark the permalink.